This is how Taras Shevchenko, Ukraine's most famous poet of the 19th century, was perceived in imperial Saint-Petersburg, how Mykola Gogol was reviving demonic Ukrainian folklore for a Russian audience, and how Polish poets like Wacław Zaleski were presenting Ukrainian popular songs, or how Austrian writers like Sacher-Masoch were depicting Galicia, the borderland of his imperial motherland. In the 20th century, the Soviet regime was busy trying to erase this "national" element. The search of national "depth" was marginalized and then openly persecuted from the 1930s. After World War II, the nostalgia for past traditions sometimes broke through the wall of censorship, creating interesting phenomena, like Ukrainian "poetic cinema" by Sergei Paradzhanov (his world famous film "Shadows of Forgotten Ancestors" is a classic example), Yuriy Illenko, Leonid Osyka, Ivan Mykolaychuk and others; but its creators often paid a high price for their dissidence. Let's look at the ways in which contemporary Ukrainian culture is looking for this mixture of tradition with modern form and language. DakhaBrakha _, _one of the most famous Ukrainian music projects of recent decades, is one example of this traditional-modern mix. 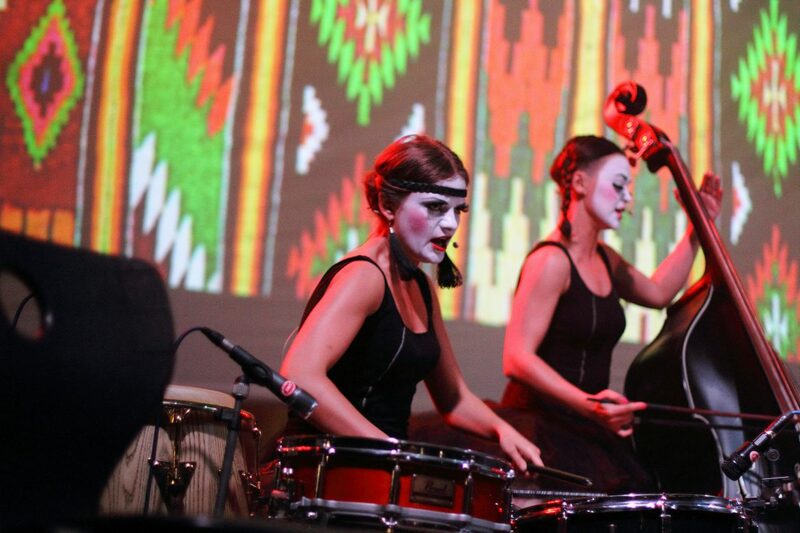 Calling their style "ethno-chaos" music, DakhaBrakha was born from the avant-garde theatre Dakh in Kyiv in the early 2000s. It combines traditional Ukrainian song with ecstatic rhythms, bringing a substantial dose of archaism into contemporary music. It is becoming increasingly popular around the world; even David Beckham used it recently in advertising for his brand. Maryana Sadovska is another famous example of Ukrainian re-invention of musical traditions. Engaged in collecting songs from various regions of Ukraine, she is now re-interpreting them in her unique performance. This performance is unusual in two ways: first, as she accompanies her singing with an Indian harmonium, giving her music a strong meditative mood; second, as she uses modern rhythms, electronic music and DJ-techniques in her latest works. Khorea Kozatska is looking for a more traditional approach towards national music, maintaining a strong commitment to genuine heritage; the group's leader, Taras Kompanichenko, plays numerous Ukrainian national instruments like the kobza, bandura, kolisna lira and others. Among other interesting ethno-rock and ethno alternative music one can mention Folknery, which is famous not only for its musical but also travel and ethnographic work; The Doox, which combines rock rhythms with traditional Ukrainian wind instruments like the sopilka, trembita, duda, dvodentsivka and others; Perkalaba or Hych Orchestra. Folk is also entering pop and electronic music. The most famous examples is, perhaps, Onuka (the name of the group means "granddaughter"), that combines ethnic melodies and instruments with electronic music, a futurist dressing style and songs in the English language. Other interesting examples of this ethno-pop are PaniValkova, Illaria, Go-A, and Zapaska. Some musicians are also experimenting by mixing Ukrainian folk music and jazz. Look at Ulyana Horbachevska and Ultramarine project, the group KoloYolo, _kolomyyka_s from Ukrainian jazzman Ihor Zakus or jazz experiments from Illaria. The Lviv-based Les Kurbas theatre is another interesting example of how tradition is being combined with modernity . Take a look, for example, at its play Lisova Pisnya (The Forest Song), based upon Lesya Ukrayinka's classic drama. Interesting mixtures of genres can be found in a project called Antonych udoma ('Antonych at home', a tribute to Ukrainian poet Bohdan Ihor Antonych) organized by Ulyana Horbachevska (singer and artist), writer Yuriy Andrukhovych and Ukrainian musicians. Ukrainian folklore tradition is also present in animation, in an elegant artistic animated movie based on Taras Shevchenko's Prychynna (Причинна), set to be released in 2018. Another interesting phenomenon is "horror animation" based upon Taras Shevchenko's work; its authors said they tried to move away from the usual image of Shevchenko and create a modern provocative interpretation. A more mainstream animation called Mavka, that is based on Lesya Ukrayinka's Lisova Pisnya, is trying to use Ukrainian folkloric and literary traditions to create an animated story for a wider audience. These are just a few examples of how today's Ukrainian culture is combining tradition and modernity. A similar trend is also present in visual arts, literature, education, design, video games and comics. An interesting thing about this phenomenon is that it erases the difference between "archaic" and "modern". It makes national traditions "fashionable", taking them through a filter of contemporary or avant-garde form.